Difference between revisions of "Rampages"
A Kill Frenzy screen in GTA 2. Rampages, also known as Kill Frenzies in Grand Theft Auto 1 and Grand Theft Auto 2, are a type of side-mission where the player has to do certain tasks in under 120 seconds (2 minutes). This type of side-mission is required for completion (except GTA San Andreas) and has been featured in nearly all GTA games prior to Grand Theft Auto IV (except the PC version of GTA San Andreas, since its rampages are 2-player based, and the PC version doesn't support it). Rampages were omitted from Grand Theft Auto IV but reappear in Grand Theft Auto: Chinatown Wars. Rampages appear in Grand Theft Auto V as a Strangers and Freaks mission string solely for Trevor Philips. Most of the tasks have the player kill a certain amount of gang members, run over pedestrians, perform drive-by's on gang members/vehicles or destroy a certain amount of vehicles. Suitable weapons are given for each rampage. In GTA San Andreas the rampages are always 2-player vehicle based. The first player drives the car, while the second one does drive-bys the other vehicles. In GTA 2, Kill Frenzies come in two forms: as green skull icons, where the player must kill a certain number of people or destroy a certain number of vehicles in a time limit with a given weapon, or as parked vehicles, where, upon entry, the player must run down a number of people or destroy a number of cars with vehicle weapons. 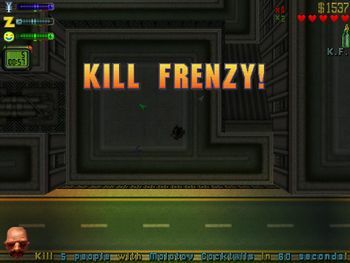 Completing a Kill Frenzy grants the player an extra life. In GTA III, if the player fails a rampage on the first attempt, a second location for the very same rampage is present. If the second location is failed then the rampage returns to its original place. The Rampages can be only completed once in GTA III, GTA Vice City, GTA Advance and GTA Liberty City Stories or can be completed multiple times in GTA San Andreas and GTA Vice City Stories. In GTA Vice City Stories, once the player passes the rampage for the first time, the white skull on the icon shows up as blue and this enables the player to play the rampages again any time they please. There is also a special option on the map which marks all completed rampages. The first rampage completed earns the player $500 ($5000 in GTA III), the next one gives $1000 ($10,000 in GTA III) and so on. In GTA Liberty City Stories, completing all rampages rewards the player with an M-60, which spawns at each of the safehouses. In the other games, only money is given for completing all rampages, as well as contributing towards completion. There are 20 rampages in GTA III and GTA Liberty City Stories, whereas GTA Vice City and the PlayStation 2 version of GTA Vice City Stories feature 35 rampages. The PSP version of GTA Vice City Stories has 30 rampages. The console versions of GTA San Andreas contains 5 two-player rampages. In GTA Chinatown Wars, there are 30 rampages, which involve killing gang members with a given weapon. Unlike previous games, the player is given henchmen to help kill enemies. Score multipliers are given for consecutive kills. Instead of there being a number of people you have to kill, the rampages work on a score basis, awarding the player a bronze, silver or gold medal. Bronze medals must be won on all rampages to obtain completion. On top of the 30 rampages, there are also five Riding Shotgun missions, which fall under the same ingame category. In GTA V, there are 5 rampage missions, which involve Trevor killing a specified number of enemies within a time limit. For each rampage, Trevor has unlimited ammunition for a specific firearm as well as 25 Grenades. There are also secondary objectives such as destroying a minimum number of vehicles, attaining a minimum number of headshots, and killing a set number of enemies beyond the target score. During the rampage, Trevor enters "rage mode" automatically, dealing double damage while receiving half. This "rage mode" is independent of Trevor's special ability, allowing the player to activate it to further enhance damage dealt and received. After successfully completing a rampage, the player can replay it via the "Replay Strangers and Freaks" menu; alternatively, after completing all 5 missions, the icons appear on the map while playing as Trevor. The censored versions of GTA III and GTA Vice City do not have any rampages. In the censored version of GTA Liberty City Stories, the game has only 13 rampages as opposed to 20, as 7 of them involved killing innocent pedestrians. Rampages made an unofficial appearance in GTA IV via modding. An on-foot Kill Frenzy icon in GTA 2. A rampage icon in GTA III. A rampage icon in GTA Vice City. A rampage icon in GTA Advance. A rampage icon in GTA Liberty City Stories. A rampage icon in GTA Vice City Stories.